Fado, Portugal’s best known but ever-mysterious music, explores how the dualities of human existence – love and loss, belonging and isolation, joy and pain – often filter through a single experience. Making his NY debut, Marco Oliveira is a singer, musician, composer and lyricist who charts fado’s topography in the modern world with tales of longing or saudade. Tania Oleiro, also making her NY debut, is an exceptional singer who reaches into fado’s past by drawing on its most traditional musical compositions, and into its future via lyrics by some of fado’s best contemporary writers. These singers will be joined by Sandro Costa on the Portuguese guitar. Costa is known as a master improviser and provocateur who has honed his craft through countless performances in Lisbon’s traditional taverns, as well as on national and international stages. 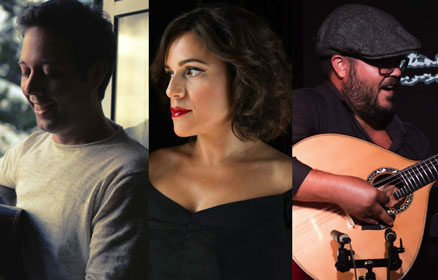 This concert is in partnership with the New York Fado Festival.